Healthcare and the cloud have a complicated relationship, given the privacy concerns and compliance involved. But here's a look at how to break that logjam. The advent of cloud computing has revolutionized the way we shop, travel, communicate, and store personal data. It's been a huge part of the digital revolution. The healthcare industry—home to tons of analog records and a spiderweb of business from single person practices to university hospitals—has lagged behind. Comprehensive cloud computing is the future of healthcare, and it's coming. Since the mid-00s, healthcare's digitalization has benefitted patients, providers, and insurers. Roadblocks to a complete cloud system for all healthcare parties are still present, such as time-intensive digitization, but becoming less and less of a problem. People are starting to realize the value that an amalgamation of data can have on the industry, and technology is becoming better. 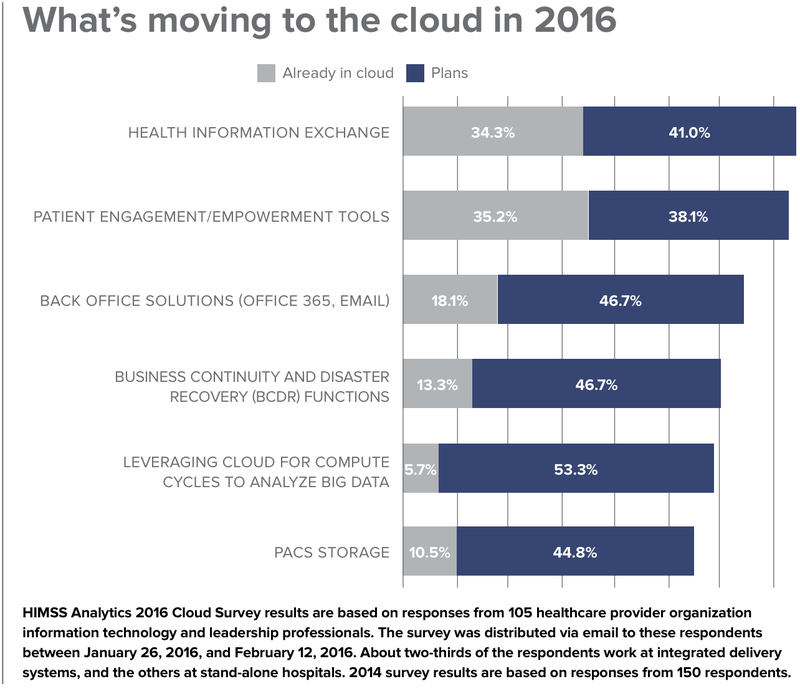 Within the next decade, we should see major strides in healthcare's move to the cloud. Information storage in healthcare today is becoming more digitized, but many factors are at play in whether or not your records have been moved to computer storage. If you're an older patient or belong to a smaller, more rural practice, there's a greater chance your records have not yet been digitized. Larger systems are moving to digital, interconnected systems. If you go to an appointment at a hospital today, you may be asked to fill out patient intake forms online prior to your visit or be identified in their system by your biometrics, for example. Many parts of healthcare are, however, still stuck in an analog, or mixed analog/digital, rut. Coordinating record transfers across institutions can be difficult, obtaining full copies of your own records can be slow, and tracking things, like which prescriptions you started when, often get lost in the cracks. We've also seen the advent of standardized procedures, such as the HIPAA (Health Insurance Portability and Accountability Act of 1996) compliance, which is a standard that outlines protections for the data privacy of medical information, and a series of declarations about individual privacy and medical data by the Council of Europe, among others. These are living documents that are constantly being reformed to fit the contemporary era, which can make keeping up compliance a continuing cost. They are, however, critical to keeping personal information safe in the cloud. Still, the industry is pursuing moving healthcare to the cloud because it offered benefits for all parties involved. Patients can expect more control over their data, and an easier time dealing with providers and insurance. Providers and insurance can streamline their internal procedures, and will both benefit from access to “big” medical data. Easier access to their own records. When records are stored on the cloud, patients should be able to keep track of their own records easily, and facilitate the exchange of information without having to go through as many hoops as the exchange of analog records. Many healthcare providers—even small practices—participate in some form of digital exchange when information needs to be passed on to a specialist, for example. Cloud computing should only enhance this flow. Less friction, especially with insurance. In theory, if the healthcare industry can adopt a widely compatible system, processing insurance for visits, prescriptions, special procedures, etc. should be as simple as notifying your insurer electronically and being approved for your plan's coverage. Since medical issues can cause patients to see different doctors and try different procedures, an accessible and sharable version of this data would be extremely beneficial for patients. More personalized care. Everyone wants their doctor to have an understanding of their medical history, but nobody wants to fill out intake form after intake form, or answer the same questions every time they see a new doctor. What if any doctor you saw knew your medical history, from a detailed, accurate family history to your most recent visit— even while traveling, or seeing a specialist? This isn't possible yet, but the cloud is helping us make strides to get there, especially regionally and within local systems. For care providers, giving service to patients involves a tremendous amount of moving parts, from doctors to office employees, insurers, pharmacies, referrals—the list goes on. Moving to the cloud, especially as an integrated cross-institution system, will improve every provider process. Better patient information—and more of it. Being able to keep track of patient information across appointments can be drastically improved. At the very least, digitization has allowed quicker updates of information and faster back-and-forths between people within the provider system. Providers will also have more aggregate data, which can help in a variety of ways. Imagine if hospitals in neighboring regions were able to automatically compare, for example, the number of flu cases coming in during flu season. Non-individualized uses for aggregate medical data will be bolstered by a connected cloud system. Better coordination with insurers. With cloud storage, keeping up to date on insurance policies, accepting, and processing insurance should become easier. Especially if insurance systems are able to receive information from provider's infrastructures, wait times for insurance processing, policy updates—anything that affects patient coverage and payment—should be quicker and easier to coordinate. Dropping redundant tools. As hospitals and other providers switch to the cloud, their workflow should become more seamless. Insurers having the power of big data behind them should make things better for everyone. Providers will be rewarded for operating efficiently and patients will have an easier time keeping track of their claims and coverage. Streamlined transactions. From patients to providers to insurers, we've already seen that cloud computing can help streamline transactions. For insurance companies, this will mean better care for their members, and less work for their internal systems. In fact, they should also see some of the same system benefits as providers. More data means better coverage. Insurance companies with the power of medical data at their fingertips should be able to increase the quality of coverage for their members by providing more accurate assessments of coverage, better knowledge about providers and courses of treatment, assessment of cost-drivers, and quicker, more efficient claim coverage. This is in no way an exhaustive list of how insurers will be able to make coverage better. If it's a Win-Win-Win, Why Hasn't Healthcare Moved to the Cloud? Yes, if healthcare entirely transferred to the cloud then a system being reliant on easily compatible platforms will undoubtedly make healthcare better for everyone. But the truth is that we haven't moved to the cloud yet for several reasons: roadblocks to actually getting data on the cloud, and theoretical concerns about the handling and privacy of data. Finishing the digitization of files. It's no surprise that years worth of medical data is time and cost intensive to digitize. Different information (ex. prescriptions vs x-ray files) need to be stored and input differently, increasing the time intensive nature of the task. Large-scale technical infrastructure. Should the healthcare industry try to build all their own infrastructure, or use an existing model to support themselves? How will this infrastructure be most securely accessible across the country—or the world? These and other questions around the fundamentals of building a large, connected database need to be resolved. One of the biggest areas of concern is legal rights about data and privacy. Not only are our laws about the internet, cloud computing, and health data changing all the time, they are non-standardized across regions. International agreements on healthcare privacy and how to hold cloud systems to an international standard are not yet commonplace. Centralized storage means a higher risk. If medical data is stored in a centralized location, one that works with many connected parts, security becomes more difficult. From authorizations to breach notifications, the industry is still figuring out maximum security for a shared healthcare cloud infrastructure . General digitization of healthcare, like EMRs, have already made a huge improvement on the healthcare industry. The next step in following through on its potential is the cloud. Yes, there are roadblocks, and it will take time and concerted effort from providers, insurers, and even governing bodies, to find the full potential of the cloud system. But because the benefit will be worth it, the move to the cloud will happen. Expect full digitization to appear soon, and healthcare on the cloud to come nipping at its heels.